The Tucson Homeskillet: Are you ready for this? The best pizza in Tucson! OK. I set it off a while back with the battle of the Sonoran hot dogs here in Tucson. Some same BK is the best while others insist that its El Guero Canelo. Me?, I like them both but I still think the best Sonoran hot dog can be found in any of the countless taco trucks and wagons across Tucson. It's how both of those two restaurants, which now have expanded into other locations due to their success, got started and it just feels and tastes more authentic to me. I was gonna say “muy authentico” but...it felt lame. Alrighty then. You ready for this one dear readers, food fans and gastro-nerds in and around Tucson? I am now gonna lay out a smackdown that would probably get me killed anywhere else (I still might get jumped though) in either Chicago, California or New York. I am now going to say who gets my vote for the best pizza in Tucson. But first! Let's take a little tour shall we? Recently I asked some friends on Facebook what their favorite pizza is and why. Back in my home state of California, which is famous for its California Pizza Kitchen style concoctions, usually ranging from BBQ chicken with grilled onions or shrimp scampi or even a peanut butter and jelly one. In the bay area, one that kept coming up was Zachary's, which is a deep dish style pizza place. It's true. When the fog rolls in and the beer flows like wine, Zachary's delivers the heartiness and flavor that any Chicago style pizza fan can admire. In my hometown of Carmel, it's Allegro's which features said PB&J amongst a slew of wild and inventive creations. But Allegro's is thin crust which some, for whatever reason, have a problem with. Here in Tucson the reigning champion of the pizza war is Brooklyn Pizza on the hip stretch of 4th Avenue. This is about as close to real New York style thin crust pizza as you can get here in Southern Arizona. It's delicious, it's near perfect and it's open late, which is always good after catching a show or boozing on 4th to grab a huge slice of Brooklyn. For me, one up on Brooklyn's pizza, as far as flavor and dough is concerned, is Upper Crust pizza on the corner of Campbell and Grant. The dough is a bit thicker, which I don't mind, but the textures and quality of ingredients are just outrageous. I absolutely love Upper Crust pizza, not only for the taste, but it's also next to one of my favorite hidden Thai restaurants and across from Bookman's, a fantastic used book and music store. There's also Magpies Pizza, which is good, but I always found their sauce and cheese to be a bit gloppy. And, of course, Old Chicago, where I work as the daytime pizza chef, which is great but corporate run so the ability to improvise and change things up is minimal. The aforementioned are all great contenders in the Tucson Pizza Cage Match of Death. But who, in my humble and always hungry opinion, is the real winner? Dove Mountain up in Marana, has, indeed, the absolute best pizza in Tucson. But why? 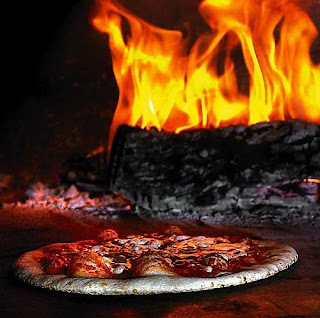 Oh why do you say that Vero Amore has the best pizza in Southern Arizona? Because there is nothing else like it within a good 100 miles. Two brothers, Aric and Joshua Mussman, came across the absolute best pizza one day. It was simple, fresh, vibrant, full of rich and complex flavor yet subtle in it's demeanor and approach. It was a true, true, Neapolitan pizza, straight from the birth place of pizza and they were hooked ever since. Aric and Joshua then had a brilliant idea. To bring this flavor and concept to Tucson. But, before doing so, they literally had to become “masters” of the Neapolitan pizza. So, the two brothers gathered up what they could and signed up to be trained by world renown Neapolitan pizza expert Peppe Miele at his Verace Pizza Napoletana academy (or VPN for short) out in Marina Del Rey California. Once certified and confident of their abilities, Aric and Josh hooked up with chef Scott Brayer and began creating and designing pizzas that were within the strict guidelines of the VPA while also gathering a sumptuous wine list, regional salads, pastas and authentic antipastos. In 2006, their dream was realized when they opened the doors of Vero Amore (which means “true love”, which is exactly what their pizzas are) and it is still growing and catching on since. She-Ra and I were totally oblivious of it's awesomeness for quite a while. Seeing as she is good friends with the Swan location's manager, who kept insisting we have to drop by and see for ourselves how amazing Vero Amore is (to which we were all “Yeah, but it's too far” or “It's kinda pricy”...both of which are false), we relented one day and popped in to say hi and have a bite. We've been hooked ever since. First off, the Caesar salad. Now, you can get any ol' Caesar in any ol' place. Heck, Old Chicago has one and it flies out of the front line window (I know, I make them now and then). But it, like most other Caesar salads, is missing something, something that I, for the most part, can't stand. It's the anchovies. Yes, that's right. If you're going to make and serve a “real” Caesar salad, you better believe you're not going to be shy with those little salty bites from the sea. And for tastebuds sake, don't overdo it on the mayo or cream, it just makes it bloopy. Vero Amore has that perfect balance of anchovy and cheese and served on fresh organic romaine? Absolutely perfect. But (now here's what this whole blog is about) the pizzas are what makes, and will make, Vero Amore famous. Using custom built brick fire ovens, kept at a continual temperature of 800 degrees (for those in Europe or Canada, uh...I'm not too hip on Fahrenheit or Celsius or whatever, so you do the convergence) and ingredients shipped over from Italy and placed on handmade house risen dough, what comes from the kitchen to your table is a wonder to see, smell and, of course, eat. Something simple like the cheese-less Pizza Marinara is something to savor. It's just fresh tomato sauce, oregano and garlic. That's it. And you know what? It's amazing. Or, and this one is a favorite of yours truly, the Pizza Bianca al Prosciutto which is without sauce and topped with their homemade mozzarella, real parmesan, prosciutto and arugula. I'm sorry, but I am a bit of an arugula whore and the prosciutto just melts in your mouth. She-Ra is a big fan of the Pizza Lussuria, which features their tangy tomato sauce, garlic, mozzarella, crushed red peppers and Genoa salami. I don't know how they do it but I'm sure glad they do, that salami, with the perfect marbling and cooked in a real wood burning oven, absolutely dissolves, oh so slowly but with enough bite to stick around and tease, on your tongue and tastebuds. It's freaking unreal. Dude, I'm getting so hungry right now. Vero Amore does have a lunch menu that serves up fresh and hot paninis, all of which, except for their Chicken Caesar, are served with spring mix, tomatoes and onion and you can choose from salami, prosciutto or peperoni or just the veggie. There is also homemade panna cotta for desert and a wide selection of Italian beers and wines to choose from. Thing is, the Swan Ave. location is so small, they have to keep the menu down to the very basics: about 2 or 3 appetizers, 4 salads, a dozen or so (amazing!) pizzas, some paninis (served only at lunchtime), and a ravioli, calzone, linguine and lasagne dishes. The Dove Mountain location is much larger and has an expansive menu, including mussels and steamed clams on their appetizers, a Cobb salad (made with a wasabi ranch dressing) and a good dozen or so pasta entrees, including chicken marsala, tilapia orleans and a Mediterranean dish with pesto cream, pine nuts, sundried tomatoes, kalamata olives and gorgonzola cheese. Not only that, but they have a full bar where the Swan Ave. place has just beer and wine. And sodas and stuff. But...that stuff doesn't interest me much. So, there you have it! My vote on what I consider and deem the best pizza in Tucson. You're just going to have to try it out to find out for yourself. I mean, you're not going to get a buffalo chicken pizza at Vero Amore nor one oozing with salsa or the infamously damned “Meat Lovers” combo. And a stuffed crust pizza? Are you insane? What are you...a stoned 10 year old? Only conglomerates that despise their clientele would pull off such a gut-bombing feat of horror. Vero Amore is fresh. It is flavorful. It is refined and it is divine. It is simple and it is perfect. Sure, I crave a Brooklyn or Upper Crust pizza now and then. Heck, we're pals with the bartender at No Anchovies down on University, so, yeah, we stop by there on the occasional afternoon or evening. 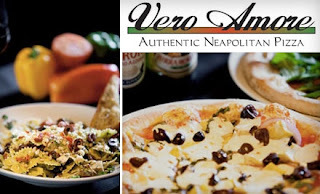 But when we are craving real ingredients, composed by real chefs that know and love what is absolutely right and responsible about real Neapolitan pizza, which is usually the case here, we go to Vero Amore, hands down the most authentic pizza you'll find in Southern Arizona. And when you do visit Vero Amore, please tell me what you think. Because I know it's going to be good. Because that's what Vero Amore is. This is so good to know! My parents are building a home on some Dove Mountain real estate at The Residences at The Ritz-Carlton, Dove Mountain. Our whole family loves going out for a great meal so I'm happy to hear that there are reputable restaurants in the Dove Mountain area. Once they are all moved in and have us down to visit we'll have to go to Vero Amore, I'm already craving that prosciutto pizza!